There’s something delicious brewing inside the redesigned and expanded Civic Center Transit Center in downtown St. Louis. Cafe Blue opened its second Metro location at the Civic Center Transit Center on Monday, and its available Monday through Friday from 6 a.m. to 7 p.m. and on Saturday and Sunday from 8 a.m. to 5 p.m. Operated and managed by Keith Davis, the cafe offers passengers and Metro employees a wide range of food items to purchase from breakfast items, baked goods and fresh salads, to pizza, snacks, coffee and other drinks. You can also find select flavors of Ted Drewes frozen custard. Cafe Blue opened its first location inside the North County Transit Center in Ferguson last year. Step inside the climate-controlled, indoor waiting area at the Civic Center Transit Center to grab a quick bite to eat at Cafe Blue, or just stop in to use the restroom or wait for your bus out of the elements, while keeping an eye on the digital arrival-time board to see when it’s time to board your bus. MetroBus service returned to the Civic Center Transit Center on August 14. 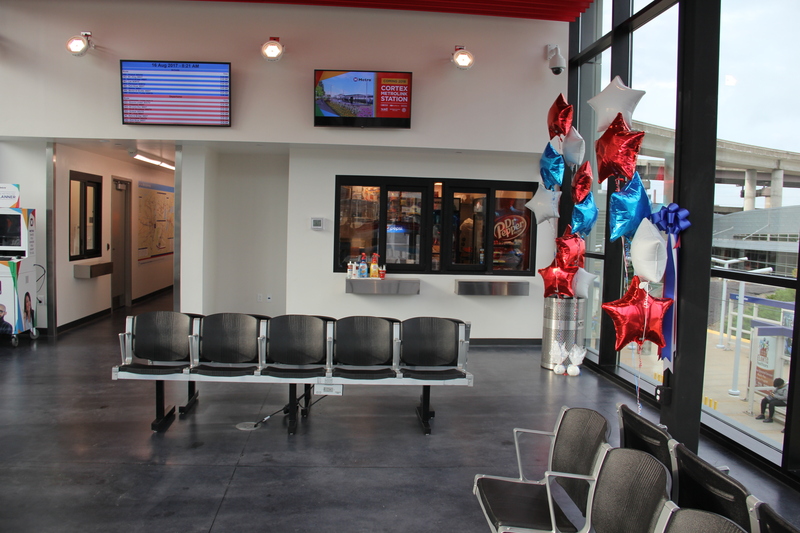 The completely redesigned facility, located at 14th and Spruce Streets, serves all 23 MetroBus routes that operate in downtown St. Louis, connecting them to MetroLink and Metro Call-A-Ride with easy access to Amtrak and Greyhound. Now THIS is how you build a transit center. The Ballas Transit Center should have been built like this. Serving coffee to passengers is a good idea for like if they have a long wait for their next bus. I got a great cup of coffee there yesterday when ducking into the station during the storm. A great place! !